Do Shoppers Like to Buy Online and Pickup in Stores? BOPIS—buy online, pickup in store—may not be the most appealing acronym, but the idea has been all the rage over the past few years. As brick-and-mortar businesses have struggled to combat the rise of online-only competitors, the offering has become increasingly common, with everyone from big-box retailers to mom-and-pop shops getting into the game. For traditional stores, the appeal of BOPIS is clear: it puts an expensive resource (real estate) to use and provides a differentiated offering. But what about consumers? Do they find buy online, pickup in store offers appealing? Is the option better than just getting products shipped? A recent report from Parago tackled these questions via a survey of 1,992 U.S. consumers from a range of demographic groups and locations. 1. 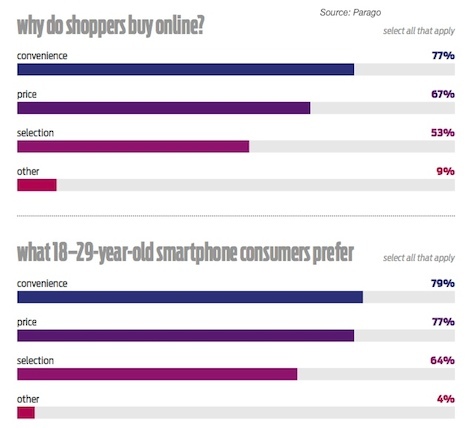 BOPIS is Already (Sort Of) Common: 64% of respondents say they already buy online and pick up in store. However, most consumers (54%) only do so a few times a year, with just 7% doing so monthly, and 3% weekly. 2. Shoppers Prefer BOPIS to Online-Only in Certain Categories: The survey found that many consumers are currently very open to BOPIS offers, and actually prefer the option over online-only purchases in a number of categories. 3. Consumers Find Online Shopping Increasingly Convenient: BOPIS’s selling point over online-only shopping has been primarily convenience (why wait for shipping when you can pick it up? ), but it appears that this advantage may be fading. The survey found that consumers increasingly see e-commerce as convenient, with 77% saying this the primary reason they go online to shop. Moreover, digital-savvy younger shoppers are even more likely to feel this way, with 79% of 18–29 year-old smartphone owners surveyed saying they shop online because it is convenient. So, what does this all mean? That consumers do seem to like the buy online, pickup in store option, but many increasingly don’t see it as being that much more convenient than getting products shipped directly from online retailers. In other words, BOPIS is an advantage for retailers but not always a huge advantage. This can be seen most clearly when it comes to price. The survey found that 63% of consumers would shift a purchase from a retailer to Amazon if there were a $5 price difference and 82% would do so if there were a $10 price difference. In other words, brick-and-mortar retailers must be competitive on price with online stores like Amazon before BOPIS becomes relevant to shoppers’ purchasing decisions. 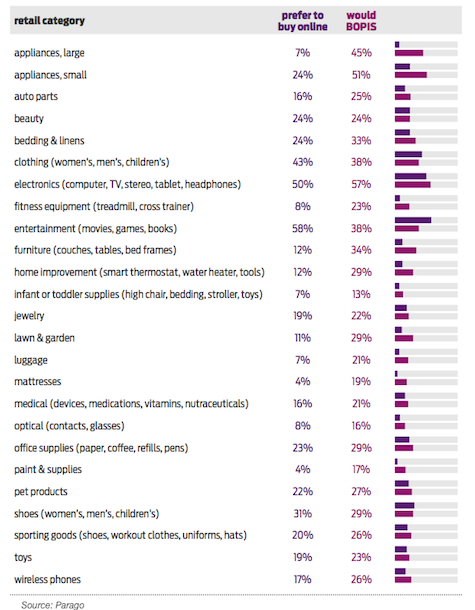 The survey results show that BOPIS is highly valued by consumers in certain shopping categories—especially those where the products are large, important to touch, and/or a pain to deliver—and not very valued in other categories. In most cases, the offering seems like something nice to have for shoppers but not as important as price and other factors. Ultimately, BOPIS seems to be a good weapon to have in your arsenal but not a silver bullet. Implement effective online marketing strategies to boost your e-commerce revenue. Contact MDG Advertising today at 561-338-7797, or visit mdgadvertising.com.